McDonald’s will soon have something even bigger than the ever-popular Quarter Pounder on its menu: the Sirloin Third Pounder. Will you be trying one of its three variations later this month? The Sirloin Third Pounder, which is already being served in some New York restaurants, will be available nationally on May 11, but only for a limited time. According to McDonald’s, the new offering will cost around $4.99 and have three variations: Lettuce and Tomato, Bacon and Cheese and Steakhouse. 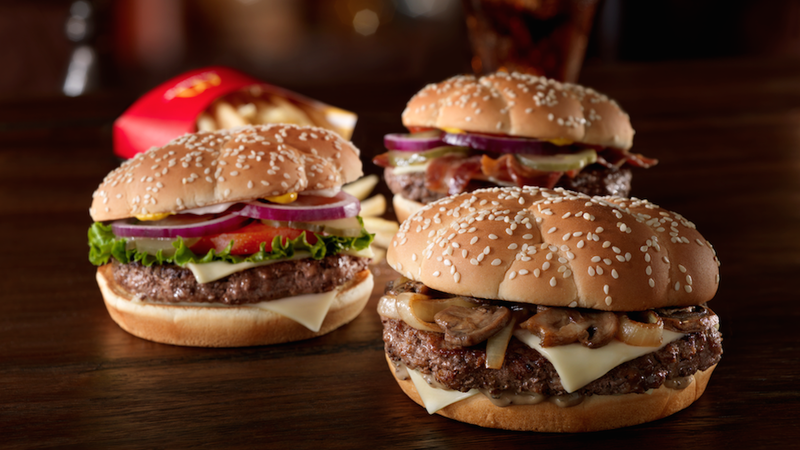 Both the Lettuce and Tomato and the Bacon and Cheese variations will come with red onions and white cheddar cheese, while the Steakhouse will be topped with sauteed mushrooms, grilled onions, white cheddar and a creamy peppercorn sauce. This isn’t actually the first time McDonald’s has offered a bigger burger. Its previous attempt, the Angus Third Pounder, was dropped from the menu in 2013 amid speculation that its price point was too high. McDonald’s is introducing its biggest burger, the Sirloin Third Pounder. Because u still have one unused notch left on your belt.